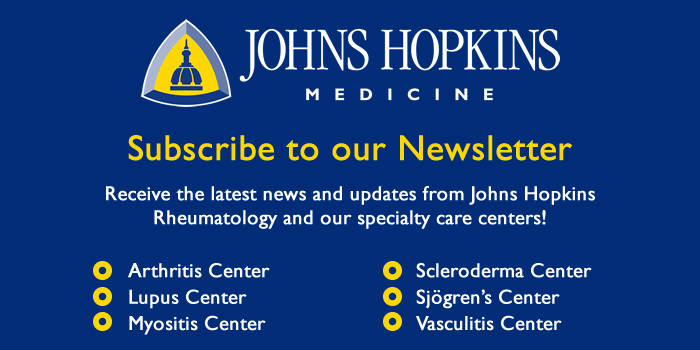 The clinical program is also coupled with clinical and basic science research in the departments of Rheumatology, Neurology, Gynecology, Otolaryngology, and Ophthalmology at the Johns Hopkins Medical Institutions. The Jerome L. Greene Sjogren’s Syndrome Center is multidisciplinary, drawing broad expertise from multiple specialties to provide the best care to patients with this disease. The accumulated wisdom of seeing literally hundreds of patients with Sjogren’s syndrome is wonderful for individual patients, as well as for scholarship and the development of knowledge in the entire field. The overall goal of the Center is to provide outstanding clinical care to patients whilst facilitating research and scholarship in this disease. The Center is structured to serve these two complementary goals: 1) the diagnosis and management of Sjögren’s syndrome in a comprehensive multidisciplinary setting, and 2) the systematic collection of data and biological samples through longitudinal care of patients attending the Sjögren’s Center, using an approved and pre-established research protocol.